Last edited by DistantLand; Mar 18th, 2009 at 14:35. Hi everyone. The Cat Lady here. 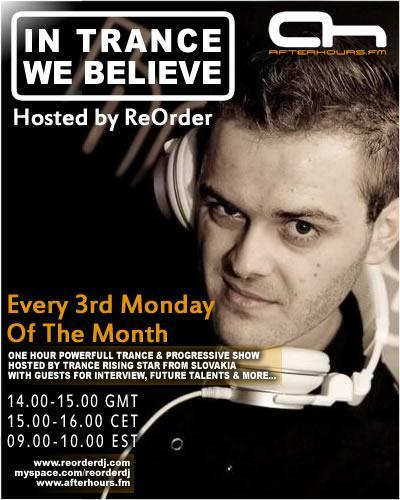 I will be doing the Tracklist duty for ReOdrer today as he will be unable to join us in the forum for this first show. A real shame, that. He is driving from Slovakia back home to Prague, a distance of about 450 km. He'll be leaving at at 14:00 and will arrive about 20:00. So ... you are stuck with me. Okay folks. This is the big day. I'm awake. I'm chooned in. I'm ready for this. Okay. WTF happened? This show is SUPPOSED to be on right NOW! Why isn't it? Supposed to be on at 8am, my time. I'm totally confused now. Oh. I'm an hour early? OMG. I'm so embarassed. America have probably been rubbish and put their clocks forward before the rest of the world again. It's still 45 mins until 14:00 here. No. I'm still right. 9am Eastern = 8am Central. It's 8:221am. It should be on. Oh. I see. No wonder I'm all fooked up. My tax dollars are at work. FAIL!! I have the first post all ready and everything. Thanks, Obama, for totally messing me up. Thanks, US Congress, for your infinite wisdom in messing up the time zones for me and everyone else in the Free World.